Franke James doesn’t have a famous name and she didn’t call Environment Minister Peter Kent a piece of excrement to highlight an issue. But the Toronto artist and environmental activist has shown no shortage of political acumen in her bid to fight back against a Conservative government she says has bullied her. She has used access to information requests, help from political allies and publicity in the media to highlight her belief that the Conservatives withdrew funding for a European tour of her art and then badmouthed her privately to shut it down because they didn’t like her view of the country’s inaction on climate change. She is the third person to pass through this column in recent months who feels she has been spied on, smacked down or targeted by a mean-spirited, micromanaging government or Conservative party always on the lookout for enemies of the state. One is an artist, one an aboriginal advocate and one a widow. All three have fought back. And all three are women. We like to say that two is a coincidence and three is a pattern. There really is no evidence the Conservatives actually target women or that women have proved more adept at getting up off the canvas and fighting back. But there are enough signs out there to raise the question. Cindy Blackstock is an advocate for aboriginal children who accessed her government files to show the government had been tailing her and spying on her after she launched a human rights complaint regarding the Conservatives’ treatment of aboriginal children. Michaela Keyserlingk, who lost her husband to asbestos-related cancer two years ago, was threatened with legal action by the Conservative party because she was using the party logo in her campaign to stop Canadian asbestos exports. She stood firm, told them what they could do with their legal threat and found political activism. James may be the most effective of the trio. The government originally did offer $5,000 in funding to help support a 20-city educational art tour James had planned, beginning in Croatia. The money was later withdrawn, as was any moral support. But James didn’t allow the story to stop there. 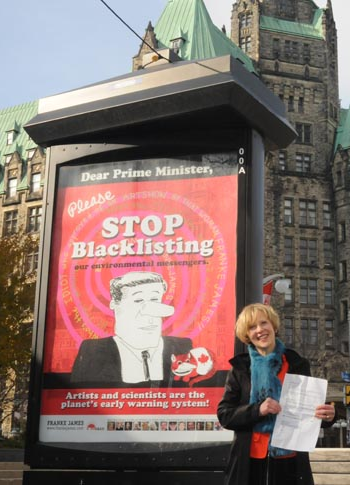 She raised money to display her “banned” art work on bus shelters in the shadow of Parliament Hill. She made noise in the media, and this weekend she was the subject of a New York Times environmental blog entitled Canada’s Approach to Inconvenient Art. Most importantly, she obtained documents that appear to show the money had been approved, then withdrawn, and that the government may have actively dissuaded a non-profit organization from proceeding with the tour. Given the international condemnation endured by the Conservative government last week after Canada became the first country to withdraw from Kyoto, its actions against an artist whose criticism is more whimsical than wicked looks ever more petty. This pettiness extends to its dealings with Blackstock and Keyserlingk and only highlights three of the most egregious failings of this government: its pariah status on the environment, its inexplicable defence of asbestos exports and its inaction on the aboriginal file. James thinks the Conservatives have underestimated the power of women. “I think more people who are blacklisted and bullied by the Harper government need to speak up — and loudly. It’s only by shining a bright light on their bullying that we can make them change,” she says. It’s a tall order but three women took steps in that direction in 2011. Reprinted from Toronto Star, in the “News|Canada” section. © 2011 Torstar Syndication Services. All rights reserved. Licensed by Franke James for 12 months on December 18, 2011. You may forward this article or obtain additional permissions at the following iCopyright license record and renewal locator: http://license.icopyright.net/3.7212-23957. Torstar Syndication Services and Toronto Star logos are registered trademarks of Torstar Syndication Services. The iCopyright logo is a registered trademark of iCopyright, Inc.